Click on above graphic to view a larger 1988px × 2493px .PNG image. 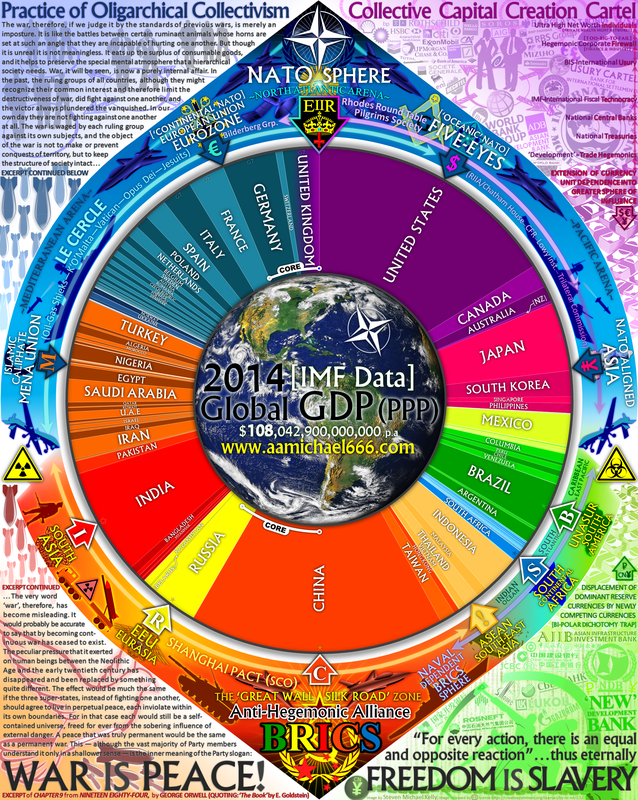 If you were wondering what the economic balance of the world and the basic geo-political dynamics of this planet look like, the above info-graphic built around the global GDP(PPP) 2014 IMF data pie chart should speak volumes. When George Orwell penned his novel Nineteen Eighty-Four, he included a plot device book written by an Emmanuel Goldstein entitled ‘The Theory And Practice Of Oligarchical Collectivism’. Those who have read the book will understand the general gist of the above graphic. The relevant Chapter 9 of Nineteen Eighty-Four can be read HERE. How good were Orwell’s social and geopolitical chess skills? . . . pretty good if you ask me. I have put this graphic together to highlight one very important aspect of my thesis regarding the coming Mecca Clock Tower ‘false-flag’ attack by ‘ISIS’: The brown area labelled Islamic Caliphate (MENA Union) represents the most important area for the NATO Sphere to consolidate. If the natural gas pipelines from the Arabian Gulf area cannot be laid up to the EU (through Syria and Iraq), then the Anglo-American Empire and the European Union have big problems in maintaining a hegemony over world finance by locking out Russia, and also controlling world raw materials extraction which is energy (oil) intensive. Energy is King. The EU is keen to import so many Muslim ‘refugees’ (some legitimate, most not) from the MENA regions, simply because they have done deals with the erstwhile leaders of a MENA Union/Caliphate to politically and socially move towards integrating the EU with such a geopolitical block. This can only be done if the borders are dissolved between these two blocks. This is not good for the Muslim world or what remains of the western world. Muslims who believe the empowerment of the GCC oligarchs is good news for Islam, probably don’t realize how far from the Abrahamic moral compass these oligarchs actually are. The NWO cares not about sovereignty and cultural contiguity. All they care about is maintaining geopolitical power and wealth for their entrenched oligarchies, and the Oil and Natural Gas Sheiks have been shacked up with Wall Street and the City of London for so long, that they’re all peas in a pod behind closed doors. For every action there is an equal and opposite reaction. Authoritarianism in the West will only breed authoritarianism in the East – and vice versa – so how can this improve the lot of the average serf whether they be Asian, Russian, African, European, or American? We are eternally at war with ourselves. Elites on all continents know this, and are quite content with this state of affairs. WAR IS PEACE!..FREEDOM IS SLAVERY!..IGNORANCE IS STRENGTH!